March Board of Directors Meeting: Register Today! Please join us for the March Board of Directors Meeting, March 1-2. The Executive Committee invites all to join them on Thursday for the Committee meeting, as well as a two-part workshop: “Combating Your Public Agency's Cyber Vulnerability Risks" and "Mitigating Risk Through Air-Tight Contracts." For more information, contact Meeting & Event Planner Brittany Sherrill. Heading to PARMA? 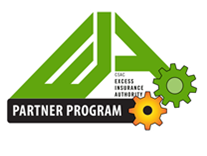 Look for our Partner Programs Logo! The EIA is currently hiring a Sr. Loss Prevention Specialist. The Senior Specialist will act as a resource to member entities providing technical information relative to occupational safety and tort liability exposures. For more information, please contact Human Resources Manager Allison Bateman.